Greet the visiting tall ship Pallada from Vladivostok, Russia--a magnificent visiting nautical dignitary under full sail, and see exactly what Poland’s Dar Młodziezy and Mir look like! The Pallada is one of six Twin Sister Ships of Poland’s magnificent Dar Młodziezy. 8:30 AM at City Yachts, through the Fort Mason parking lot, located off Marina Boulevard where it intersects with Laguna. The dock is between Fort Mason and the Marina Green yacht harbor. 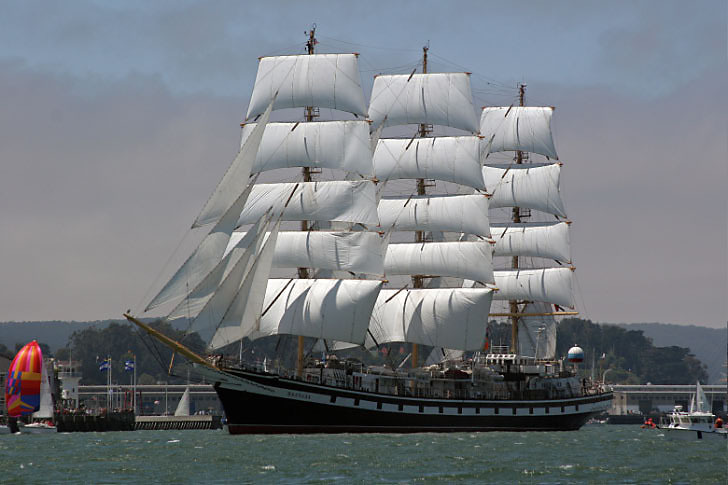 Join groups from Fort Ross, the California State Parks Association, the Russian Consulate in San Francisco, the local Russian community, the Golden Gate Tall Ships Society, and LeaderSHIP Voyages to officially welcome the Pallada to the Bay Area! The best way to appreciate the beauty and sailing ability of a tall ship like the Pallada is to see her sailing. Don’t miss this rare opportunity. About the Pallada: Pallada is named after Pallas Athena, the Greek Goddess of wisdom. She was built in Poland at the Gdańk shipyard in 1989. Like the Dar Młodziezy, the Pallada is an educational institution: the training vessel of a maritime university. She will be sailed by a crew of young students on their 1st visit to San Francisco and their teachers. The Pallada is 356’ long, and has 3 huge masts, all with square sails on them. This rigging is called a Full Rigged Ship and it is VERY RARE. She will be sailing into the Bay with the wind at her back, so we may see her in full splendor. The Dar Młodziezy Sister Ships: Poland’s Dar Młodziezy (“Gift of Youth” – built with funds raised by school children) and Mir (“Peace” or “World” – recognized as the fastest tall ship in the world), and Russia’s Khersones (an ancient Ukrainian city founded by Greeks), Pallada, Drushzba ("Friendship") and Nadeshzda ("Hope").